Prague, 5 June 2015 – “The Church proclaims that marriage is a sacrament, but we must explain what this means: first of all, that it embodies grace. And grace signifies not just God’s help so that the husband and wife remain in love and faithfulness, with courage and patience, without selfishness, bearing each other’s burdens; not just God’s help so that each person can carry out their own tasks and fulfill their own responsibilities. Grace means much more: it is divine life, participation, the start and foundation of life: it is the presence of God who gives himself and saves us. Christian marriage is deeply rooted in the Divine mystery of salvation”. 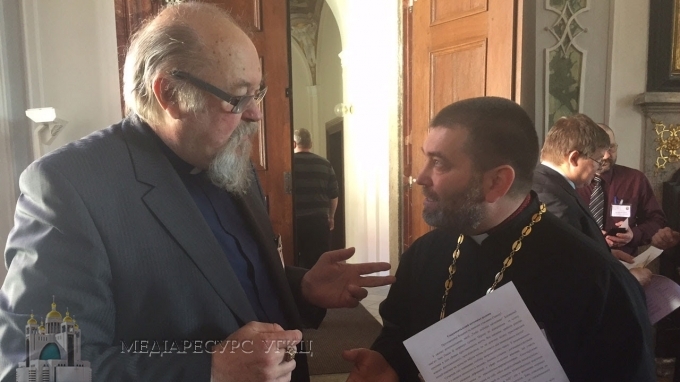 With this invitation to explain in depth how divine grace acts in the sacrament of matrimony Don Volodymyr Los, a priest from the Greek-Catholic diocese of Buchach in Ukraine, opened the second part of the morning at the meeting of the Eastern Catholic bishops. In Prague, more than 40 representatives of the Eastern Catholic Churches from the European continent gathered to prepare for discussions at the next Synod of Bishops on the family (October 2015), reflected on The sacramental potential of the family. According to Fr Los, the modern world is experiencing a profound anthropological crisis, characterised by the “the loss of the human in the human person”, by the “de-sacramentalisation of the person”, where human relations become “egotistical-consumerist and pragamatic-commercial” and “since the family is an integral institution of society, today it too feels the effects of the problem”. Hence the “primary mission” of the Church “[is] to identify the spiritual dangers of the modern world, to support families spiritually, seeking to proclaim God’s plan concerning marriage and the family”. Having recalled the operational significance of the sacraments in the life of the family, the Ukrainian priest called for an “optimisation of pastoral support, the spiritual accompaniment of the family – from the moment of its birth and throughout the whole of its life”. According to Fr Los, “the realisation of the sacramental potential of the family in the sacraments through evangelisation and catechesis is the key for a formation of spiritually mature Christian families, each of which, as a unique sacramental living cell of the Church, is guarantor of the prosperity of the Christian family and the realisation of the divine plan of salvation of humanity”.